1.In medium bowl, stir broth, Worcestershire, mustard and Tabasco sauce to taste. Place beef in bottom of 5- to 6-quart slow cooker. Pour broth mixture over beef; sprinkle with steak seasoning. Cover slow cooker with lid; cook on high 4 hours (low 7 hours). 2.Transfer beef to large bowl. With 2 forks, shred beef; return shredded beef to slow cooker. Cover slow cooker with lid; cook on low 1 hour. 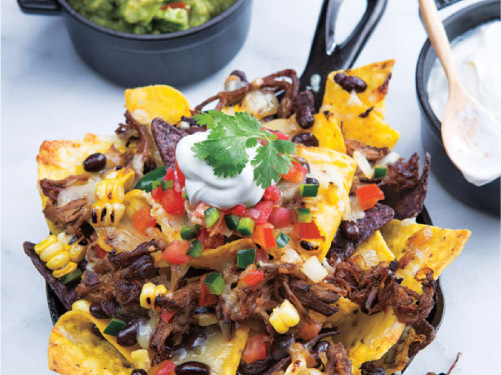 > Layer tortilla chips with shredded beef, cheese, black beans and grilled fresh corn in a cast iron skillet and bake at 350°F for 5 minutes or until the cheese melts. Top with chopped tomatoes, chopped jalapeño peppers, sour cream and cilantro, and serve with guacamole.